Khangsar Tenpé Wangchuk was born amidst miraculous signs in Akyong Khangsar in Golok at dawn on January 1st 1938. The time of his birth was marked by the conjunction of 'four tigers': he was born in the Earth Tiger year, in the tiger month, on the tiger day, and at dawn, which is the time of the tiger. He was soon recognized as the incarnation of Payak Önpo Rigdzin Dorje, who was an emanation of Yudra Nyingpo, one of Guru Rinpoche's twenty-five disciples. He studied with Palyul Choktrul Jampal Gyepe Dorje, Akyong Tokden Rinpoche Lodrö Gyatso and other masters, gaining profound levels of realization, so that he met deities in visions and received prophecies from them, and his understanding of the sutras and tantras expanded to became limitlessly vast. He revealed both earth and mind termas. Some of them he even unearthed in public, before crowds of people. 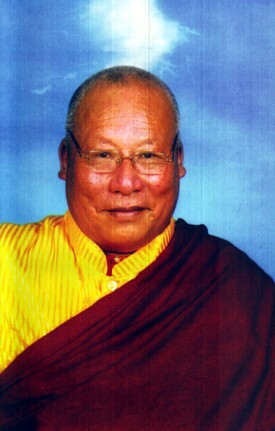 Khenpo Jikmé Phuntsok declared him to be a great bodhisattva who had reached the more advanced stages (bhumis). He established both Khangsar Taklung Monastery and Payak Monastery. His collected writings include commentaries on The Thirty-Seven Practices of a Bodhisattva, Rigdzin Düpa, Tsik Sum Né Dek, Longchenpa's Neluk Dzö and Chöying Dzö, and Shabkar's Flight of the Garuda. This page was last edited on 26 April 2014, at 15:39.